December brings with it a bunch of exciting things! 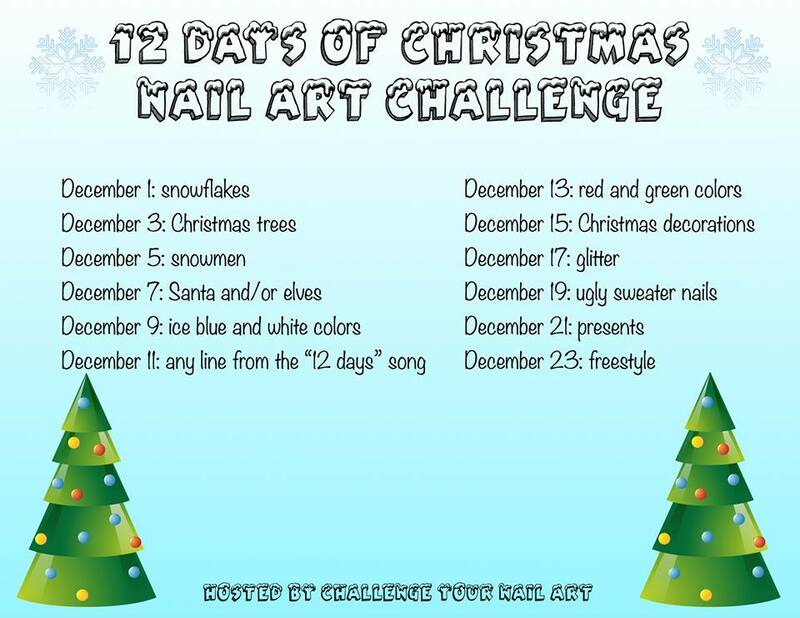 The first is that I get to start opening my Ciaté Mini Mani Manor Advent Calendar, and the second is that the 12 Days of Christmas Nail Art Challenge kicks off! I haven't decided how to share the first item with you, but for the second you get to look forward to new nail art every other day until Christmas! Hooray! I'm really excited about some of the fills I have prepared/planned for this challenge. This look started off with my first-ever attempt at a circle gradient. I used three shades to create my base: Zoya Sailor, Essie Avenue Maintain and Sinful Colors Snow Me White. I gave it a quick coat of OPI Pirouette My Whistle to add some basic snow and then stamped on my full flakes with Konad White Stamping Polish and plate QA19 from Born Pretty Store. Seal the whole thing with a layer of top coat and we're ready to go play in the snow! And just for fun here's a macro look at this art. You can really see the semi-transparent white glitter from OPI Pirouette My Whistle in this one! Your nails are gorgeous - a perfect start to December! Lovely! I love how the snowflakes are more subtle in this one. About the Ciaté advent calendar, maybe do a weekly post with the polishes you got that week? I like the idea of a weekly post... I'm thinking I might do a weekly post with a one-finger swatch? I don't think I'd have time for much more than that! Oh, this is lovely! The white glitter is perfect for the theme! Very pretty! I love everything from the gradient to the glitter and stamping! 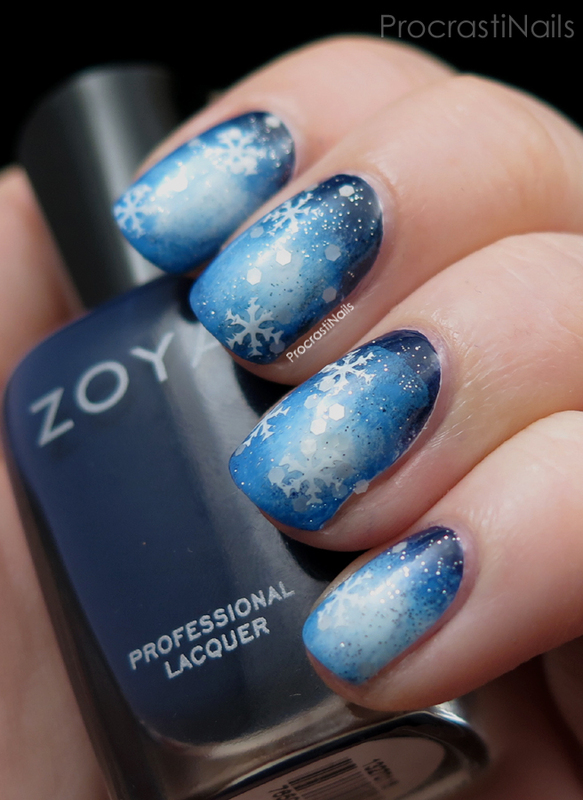 I think the prettiest snowflake mani I have ever seen! Beautiful!! The circle gradient looks awesome and overall it's just so pretty! I'm really happy with how the circle gradient turned out - there were a few times as I did it that I wasn't too confident in that! Thanks! The circle gradient came out wonderful! And such lovely snowflakes ♥. Thank you! I'm really really happy with it! Love the addition of the glitter for added snow, and the circle gradient came out great! This is awesome! I love it! It turned out amazing! That's lovely! I like the colours you used and I honestly thought the snowflakes were stickers! That's such a nice compliment! The stamp picked up really well, I'm super happy with it. :) Thanks!! I love the wintery feels to this! Its been so cold where I live but there hasn't been much snow yet. I love all these holiday looks. It reminds me that I should really be doing some holiday art like NOW!! Great job! I love this circle gradient, I have to try this out! Did you use a sponge? What was your method, this whole thing just looks great! These are so lovely! And perfect for Winter! Love! I love the circle gradient background - I really need to try this technique! 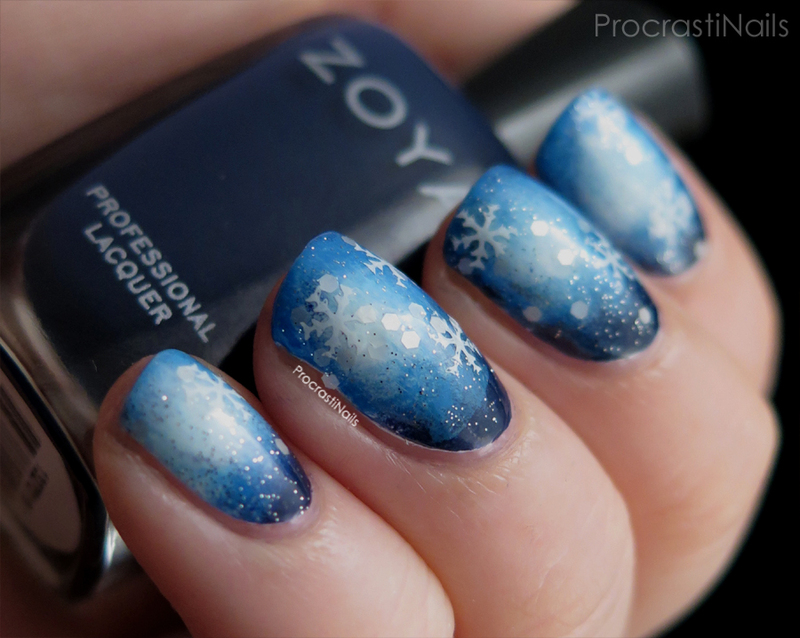 Beautiful winter nail art! It's perfect! This is beautiful!! I love this manicure! I love this!!! Beautiful circular gradient, too!! I really love this mani! The gradient looks great, everything comes together perfectly! 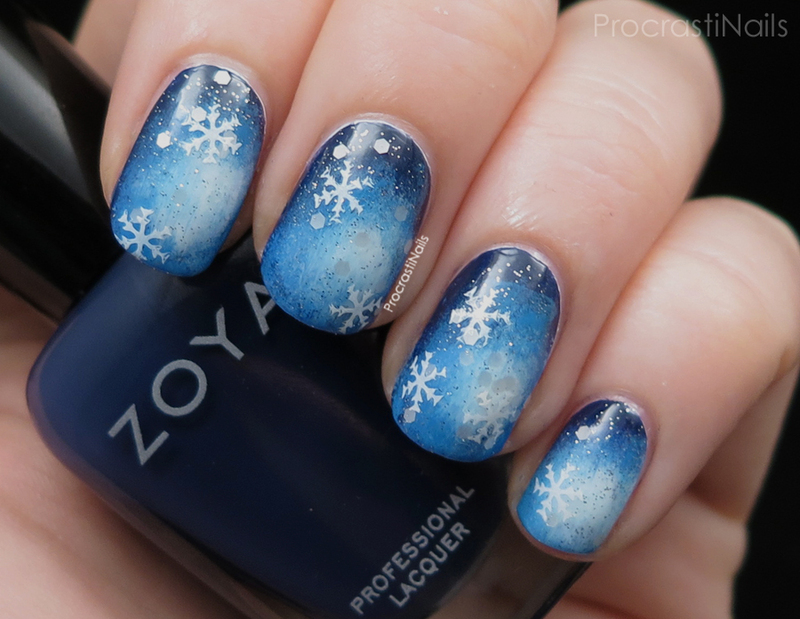 Wow, this is one of the prettiest snowflake manis I'v ever seen! Absolutely beautiful! 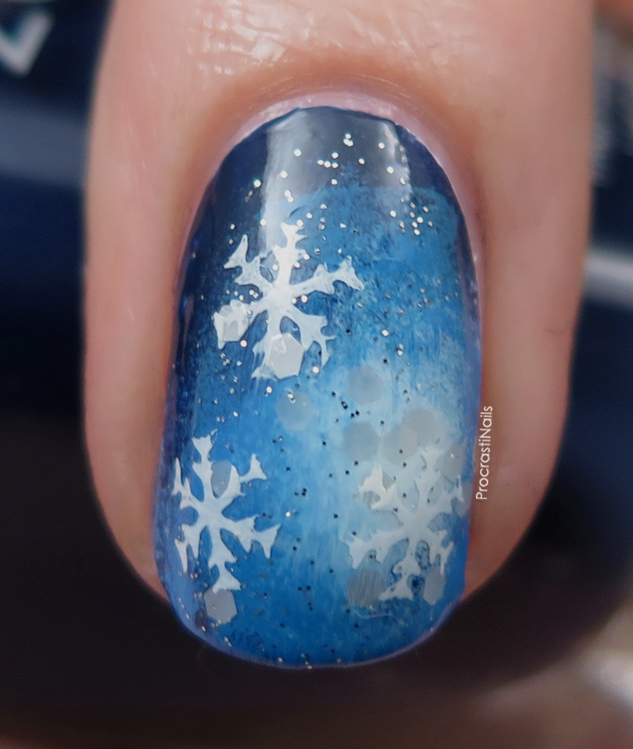 I love how your snowflakes seem to float on the nail.